Club life was life to an Edwardian gentleman. There he could unwind, dine, play cards, smoke, and chat in a wholly masculine enclave–some even provided temporary quarters for its members down from the country (or in dire need to avoid their London home). The Edwardian era was the apogee of the gentleman’s club (one could posit that the entrance of women into the workforce and rise of the women’s suffrage movement chased gentlemen into arenas where women could never penetrate–though at the same time, the Edwardian era also saw the establishment of co-ed clubs). The Edwardian man could belong to as many or as few clubs as he liked, each catering to his politics, his personal interests, and his sporting activities. The crème de la crème of clubland were situated along St. James’s Street and Pall Mall. There one could find a mix of long-revered traditional clubs with newer additions–though all were extremely aristocratic. St. James’s was the site of the famed White’s, Boodle’s, and Brooks’s clubs, as well as the Conservative, Junior Army & Navy, Devonshire and the New Oxford & Cambridge. Pall Mall boasted the very aristocratic Guards’ Club, the Army & Navy, Marlborough, Carlton, Reform, Travellers’, Athenaeum, and the Junior Carlton. White’s was the most prominent club of all, but it was a purely social club. Boodle’s was also social and non-political. The major political clubs were Brooks’s (Liberal), Carlton (premier Conservative club), Junior Carlton, and the Reform. The military had clubs for every branch and rank, but the Guards’ club, whose membership was restricted to officers of the Guards Division (Coldstream, Grenadier Guards, and Scots Guards), was the toniest of them all. The top sporting clubs were the Travellers’ (of which one was required to have traveled 500 or more miles away from London to be eligible to join), the Turf, the Automobile, Hurlingham, Ranelagh, and the Royal London Yacht Club. The other leading social clubs were the Junior Athenaeum, the Marlborough (formed by Edward VII when Prince of Wales), Beefsteak, Portland, and the Savile. In any one of these clubs, alliances were formed and solidified, and like-minded men could gravitate towards one another for a nominal annual fee (a gentleman always paid his club [and mess, if he were an officer] bills before any other debt, at the risk of social ruin!). At one point, during the Constitutional crisis of 1910-11, the gentle balance between one’s political persuasion and one’s social circle tipped wildly towards sticking with those who shared one’s politics–to the detriment of the peace within purely social clubs. 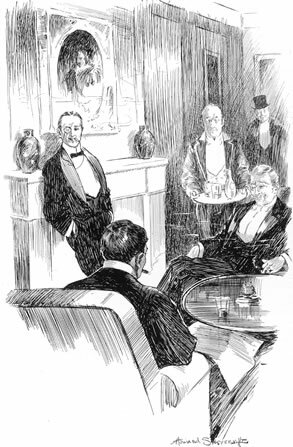 Nevertheless, the gentlemen’s club remained a bastion of civility and aristocratic privilege, and many in other social classes mimicked its manners and mores. Personally I like the idea of men having these types of clubs today and think it really lies within the realm of the A MANS right to freedom of association. Good post. This gives such an interesting slant on British society of the era. I think many of those clubs were started even earlier, in the Victorian Era. And the 18th century! They arose from the coffee-houses of London, where Johnson, Boswell, et al chatted over about society and literature.